I love paint and painting. Not all painting projects are fun though…even to me 🙂 The idea of spending hours with a paint brush getting into nooks and crannies in the hot weather, that would be last on my list of fun things I like to do. I’ve had several painting conversations lately with friends and family members. 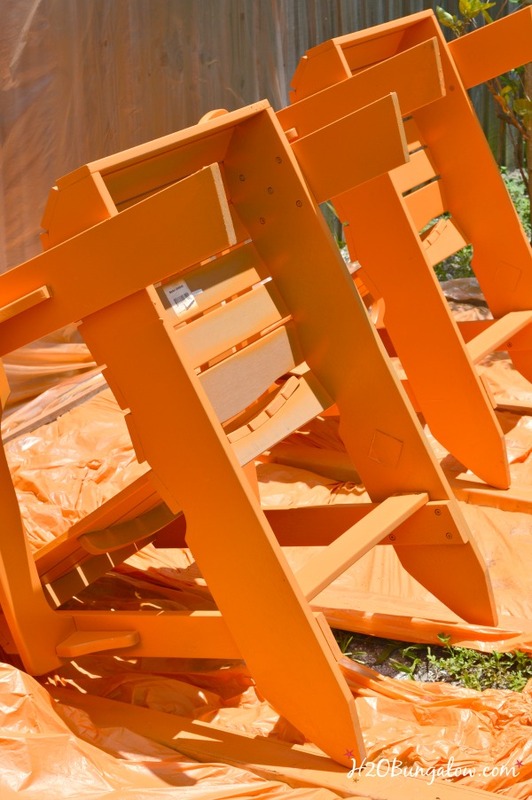 Mainly over the best way to tackle painting outdoor furniture. Everyone I spoke to had the same questions. After sharing the same answers a few times, I realized these are common questions. 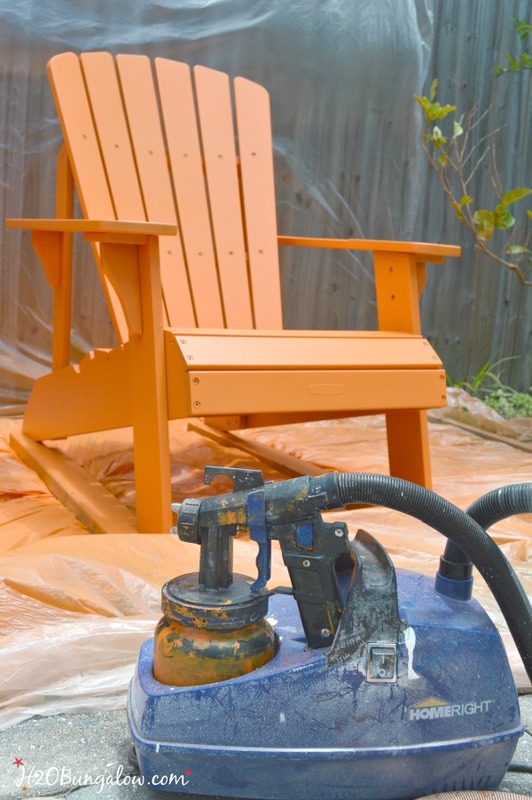 Today, I’m sharing my expertise and a quick video on how easy it is to paint outdoor furniture with a paint sprayer, particularly the Finish Max Pro paint sprayer, which is what I use and swear by for the quality and ease of use. Before I had my Finish Max Pro, I’d wanted a paint sprayer for the loooongest time. I had no idea if I’d like one, if it would work well, save me any time or just be a huge hassle to use. But, I knew the finish I could get would be superior to anything I could get with a brush. I got my Finish Max Pro paint sprayer last fall when I was painting the trim and doors for our bathroom renovation. As soon as I tried it out, I knew it was the right machine for my needs. 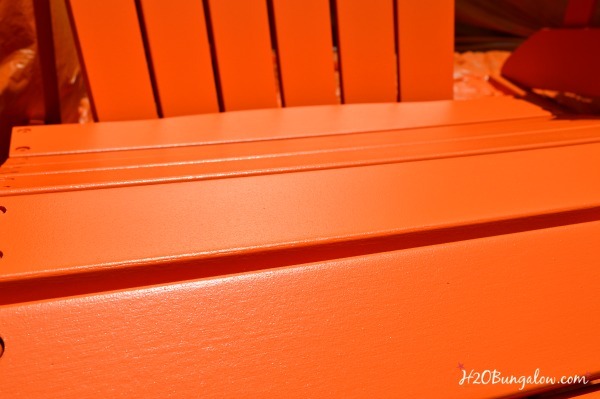 These are my top 7 reasons to paint outdoor furniture with a paint sprayer and I made a quick video to share how easy it is to use the Finish Max Pro. Warning! This is not a glamour video… it’s me, in painting clothes and no make-up with the sun in my eyes. But, what you will see is how easy the Finish Max Pro is to use and how to use it. My top reasons for using the Finish Max Pro paint sprayer. #1 . It’s fast. I painted all four of my chairs in a few hours. I haven’t been able to plan many big outside jobs since we’ve had so many rain days here on the west coast of FL this year. It seems every day the weather reports are showing rain,chance of rain..thunderstorms.. ugh. 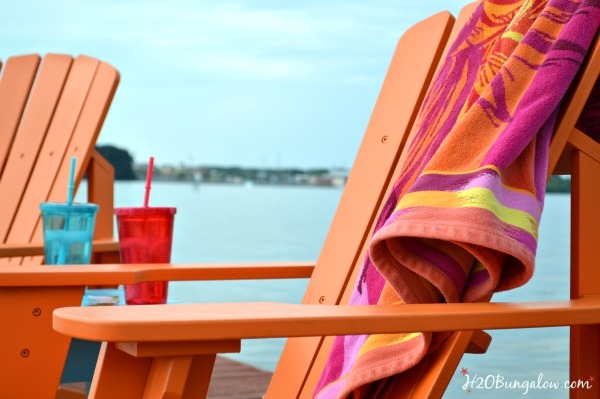 These chairs have waited for a makeover all season long! I painted all of them in a morning, they dried to the touch and I stored them in the garage to let the paint cure before the afternoon showers arrived. #2. It works well in a tight space. Since I started landscaping the front yard, I don’t have much room to paint anymore. #3. It doesn’t make a big mess, there’s hardly any over spray. #4. It easily gets where brushes don’t. I saved hours and hours of hand painting little nooks and crannies. #5. Who doesn’t love a perfect, professional looking finish? #6. Clean up is easy. Soap and Water in a bucket. #7. 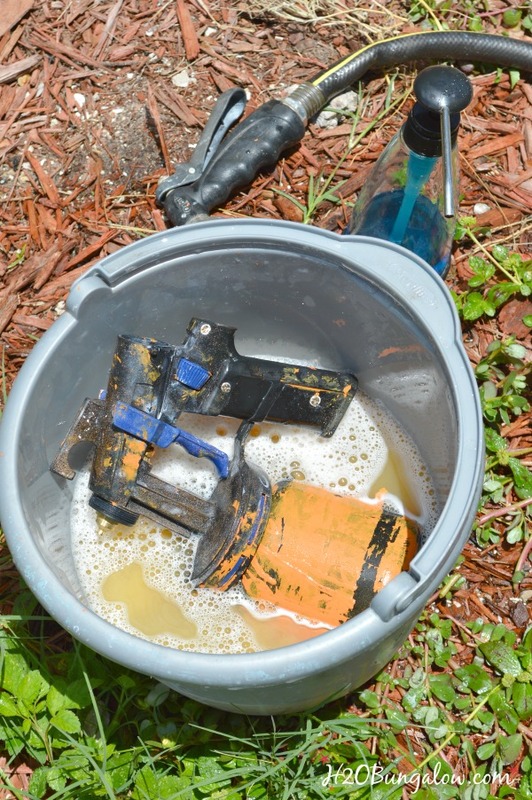 The Finish Max Pro paint sprayer and replacement parts are affordable and easy to find. For all the reasons above, I recommend using a paint sprayer to paint outdoor furniture and I highly recommend the Finish Max Pro. It gives me more time for relaxing. Time for watching the dolphins and stingrays swim by. 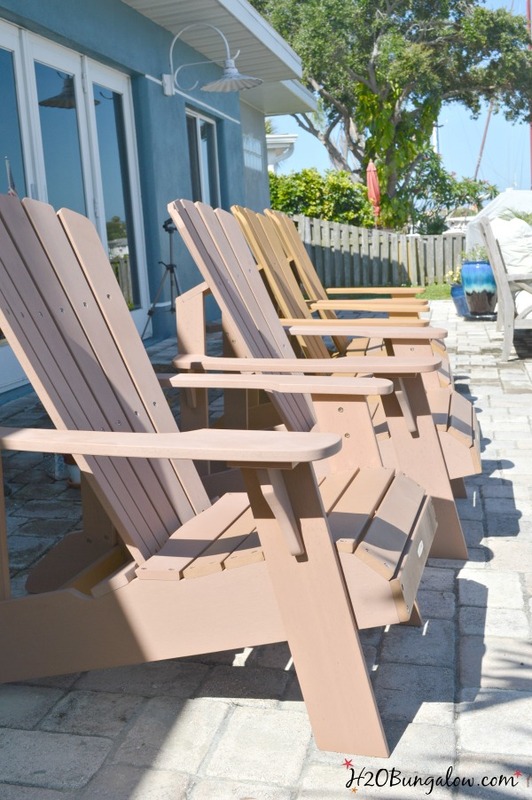 What fresh summer color would you pick to paint outdoor furniture with a paint sprayer? You can find more information about HomeRight and their full product line HERE. As you might have guessed this is a sponsored post, I was provided product and, or compensated for sharing this information. All opinions, craftiness, and projects are 100% my own and never for sale. I’ll only share items I think have value for my readers. Wendi! 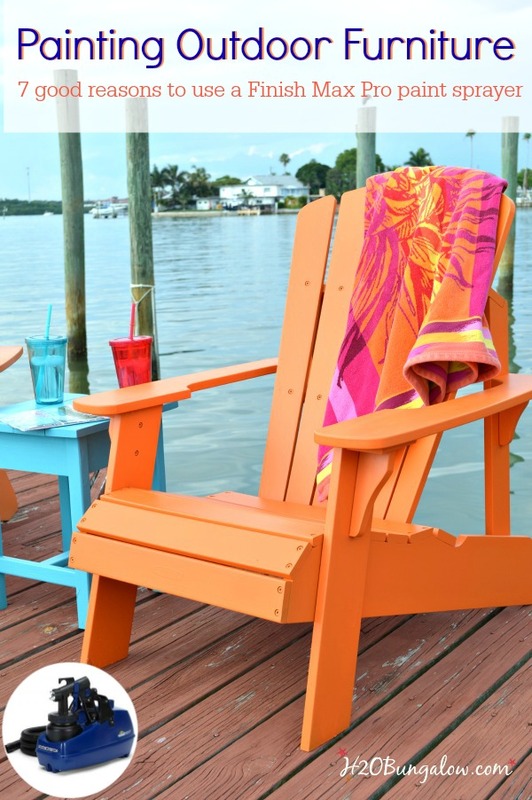 Love, love , love the fresh cheerful color you chose for these chairs! I love my sprayer, I have a couple different ones but the home max one is definitely the easiest for cleaning and I don’t have to worry about it rusting. I hope you have a great weekend! Love the color you chose! I’ve never tried a paint sprayer but the next big paint project, I’ll have to remember this. Visiting from Inspiration2 party. Hi Victoria & thank you. 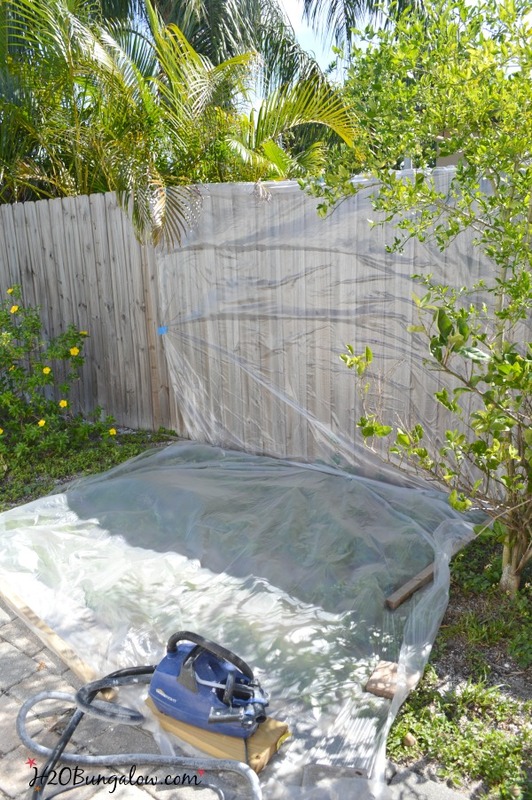 Using a paint sprayer seems scary at first, but it’s so easy and such a huge time saver! Thanks so much for your visit! Great post, thanks for the tips! Your chairs came out great! Thanks for linking up to Merry Monday! Pinned! Have a great week! Hi Kim:) Thanks, I love these chairs. It took me forever to decide to paint them and now I wonder why. Thanks so much for your visit! Liz, You just made my week with your very nice note. 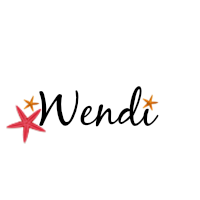 I always hope that others will find my projects as exciting as I do or at least informative and interesting. I absolutely love sharing what I know and am learning. It’s so nice when a reader takes a moment to let me know they enjoy my work. Thank you… & I hope you have a fantastic week yourself! 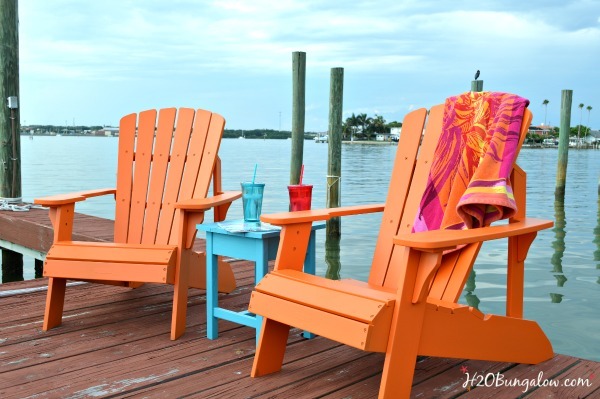 Oh my am I crush’n on the beautiful color you sprayed your Adirondack chairs – so pretty with the turquoise tables you made! Last year, before I got my fabulous HomeRight paint sprayer I brushed all four of my Adirondack chairs and it took forever. Never never again will I use a brush for projects like this. Thanks so much girlfriend. 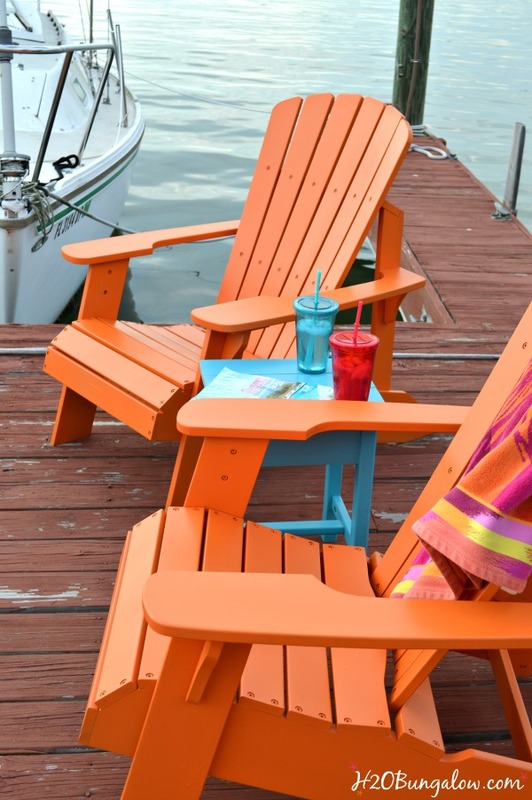 You come on down where it’s warm and – mostly sunny and share a glass of wine with me on my dock in these newly painted happy colored chairs! Seriously- I will never pick up a brush again for this type of project It was so fast and the results are so perfect! First of all I love the color you chose – it looks stunning against the blue waters. Secondly, I am sold. I need to buy me the paint gun because like you explained “all the crannies and nooks” are made easy. Plus the finish looks perfectly smooth.